Effective libraries stand at the heart of their communities. They are centres for learning and empowerment, places for meeting and building networks, and drivers of innovation and creativity. This is what makes Sustainable Development Goal 11, which focuses on what is needed to ensure everyone can take place in community and civic life, such a great area for showing how libraries contribute to development. You can find out more about the United Nations’ Sustainable Development Goals and libraries on the IFLA website. In 2018, IFLA will be bringing together stories and evidence about how libraries help deliver SDG11. This blog starts this process by bringing out seven key themes covered in the ten targets it covers, and how they relate to our institutions. Target 11.1 underlines that all should have access to safe and affordable housing and basic services. Libraries have been recognised as a basic service for well over a century, seen as one of the best ways to give individuals the opportunity to read, learn, and improve their lives. Even for those who don’t have a regular home, libraries are there; IFLA has provided guidance for libraries serving people experiencing homelessness in order to help promote best practices. Target 11.3 underlines the need for sustainable settlement planning and management. Libraries still have a powerful civic value, and can be the heart of efforts to bring prosperity back to previously depressed areas, as this article from the Goethe Institute suggests. 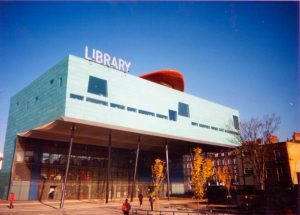 From Peckham Library in South London to the new library in Stuttgart, Germany, Libraries can help turn districts around. Target 11.4 covers the importance of safeguarding cultural heritage. While museums and galleries may hold paintings, sculptures and objects, libraries hold much of our written heritage. The books, manuscripts, newspapers – and increasingly websites – that they collect are essential for any effort to understand our past. As a huge network of expertise and dedication, the world’s libraries are essential for achieving this target, as the IFLA statement of 2017 underlines. Target 11.5 focuses on disaster readiness, and the need to plan for the worst in order to avoid it. Libraries themselves are of course not immune to damage from both natural and man-made disasters. 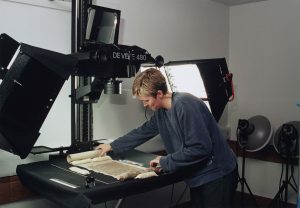 IFLA’s Risk Register offers a complement to national registers of unique collections, in order to help target safeguarding efforts in times of crisis, and a number of its Preservation and Conversation Centres focus on disaster response. But libraries are not just victims. They can also provide a secondary emergency service as a community centre and provider of Internet access. As was seen in Texas after the hurricanes of 2017, libraries have proved their potential as an anchor in disaster-struck areas. Target 11.6 underlines the need for cities to reduce their environmental impact. Pollution, waste, and the use of land that would otherwise be green all play a role. Libraries themselves have often served as showcases of greener building techniques – Greenpoint Library in Brooklyn, New York will even share a building with an Environmental Education Centre, and IFLA’s Environment, Sustainability and Libraries Special Interest Group has its own Green Libraries Checklist. But libraries are also, arguably, a forerunner of the sharing economy – allowing one book to serve many different users. And today, there are countless stories of libraries lending other things, such as tools, helping to cut back on consumption and so waste. Target 11.7 calls for the provision of safe, inclusive and accessible public spaces for all. This is an important role, given that many groups still feel insecure in many places that are supposed to be open for them. Risk of harassment, rigid social codes, crime, noise, and physical inaccessibility can all make spaces less public than they should be. The concept of libraries as ‘third spaces’ is well-established, and IFLA has a number of guidelines designed to ensure everyone can feel welcome in our institutions. Perhaps the most powerful example is still that of Colombia, where libraries have been at the forefront of efforts to help communities affected by violence come together and build a peaceful future. Target 11a focuses on the link between urban and rural development. As a network of professionals united by the same values and objectives, libraries can play a role here too, from mobile libraries sent out from towns to surrounding villages (such as in Ghana’s Upper Volta region) to using TV White Space to bring Internet access to all. 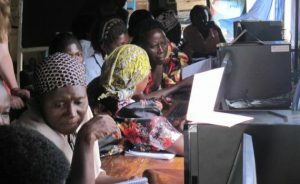 The work of Uganda’s national library, based in Kampala, to engage through local libraries and telecentres to bring information, knowledge and skills to women farmers in rural areas, provides a great example of how libraries can make the link between the capital and the countryside. Clearly this is not the only look at how libraries contribute to communities. The Australian Library and Information Association’s submission to a consultation on smart cities looks at libraries as urban development hubs, technology hotspots, supports for business and enterprise, and as a place to learn throughout life. And a report from the Institute of Museum and Library Services focuses on how libraries can engage in – and boost – community wellbeing.